So are "rock buggys" or non street registered 4x4s legal for use in NH? Per 215-A:21 Chapter II "no OHRV shall be operated in this state unless registered as provided in this chapter. No registration shall be required for an OHRV operated solely on land owned or leased by the owner of the OHRV." Does my street registered 4x4 require an OHRV Sticker? The registered part of the 215-A:21 Chapter II (above) is the gray area where street registered 4x4s are not required to obtain an OHRV sticker for use on Private Land. What about traveling Class 6 Roads with my OHRV "buggy"? Town selectman can authorize the use of OHRVs on town roads per RSA 215-A:6 Chapter IX. Pursuant to RSA 215-A:15. Per the above information a 4x4 non registered vehicle a.k.a. "buggy" is an OHRV. Next you'll need to find towns that allow OHRVs on their town roads, and you'll need to know which type of roads are open to OHRVs (Class 4, 5, and/or 6). You will not be able to drive on "ATV" trails (Class 4, 5, or 6 highways open to OHRV use are not trails) with a buggy that is registered as an OHRV. So how do I register my "Buggy" as an OHRV? If this is the first time you are registering your 4x4 you will need some type of title or bill of sale. While most true "buggys" don't have anything left of the original body or the VIN plate, the engines do have a VIN and this can be used as the buggy's ID. Every year after, you will be able to use the previous year's registration. NH does not require the use of seatblets for people 18 or over, however if you have a "buggy",you'd be foolish not to have and use these! While the speeds obtained on true "buggy" trails wouldn't require eye protection, while operating at speeds legal on Class VI roads (defined below) eye protection is strongly advised. Per RSA 215-A:13-a any person under the age of 18 IS required to wear protective headgear and eye protection when operating (driving) an OHRV. Lights are NOT required UNLESS you are out driving 30minutes before dawn or 30minutes after dusk you will need at least one head light and one tail light Per RSA RSA 215 A:1 Chapter I. Good brakes are also required per RSA 215-A:14 Chapter I (2). This RSA required the braking system to stop an OHRV 40 feet at 20 miles per hour, or locking the tires to a standstill. How fast can I travel on Class 6 roads that allow OHRV travel. (a) No person shall operate an OHRV at a speed greater than is reasonable and prudent under the existing conditions and without regard for actual and potential hazards. In all cases speed shall be controlled so that the operator will be able to avoid colliding with any person, vehicle, or object. (1) 10 miles per hour within 150 feet of any so-called bob-house, fishing shanty or occupied fishing hole of another. (2) 10 miles per hour on class I through VI highways when the OHRV is being operated within the rights-of-way adjacent to such highways; town or city sidewalks; class IV, V, and VI highways approved for OHRV operation; and bridges open for OHRV operation. (3) 10 miles per hour at trail junctions or parking lots, or when passing trail grooming equipment. (4) 15 miles per hour on plowed roads on department of resources and economic development property open to OHRV operation. (5) 35 miles per hour on all trail connectors. (6) 45 miles per hour when operating an OHRV or snowmobile on any approved OHRV trail. (c) The prima facie speed limits set forth in subparagraph (b) may be altered for a specific hazard. (d) The driver of every OHRV shall, consistent with the requirements of subparagraph (a), drive at an appropriate reduced speed when approaching and crossing an intersection or railway grade crossing, when approaching and going around a curve, when approaching a hillcrest, when traveling upon any narrow or winding trail, and when a special hazard exists with respect to pedestrians or other traffic by reason of weather or trail conditions. Last edited by Scott Hatch on Sat Jan 29, 2011 3:14 pm, edited 1 time in total. 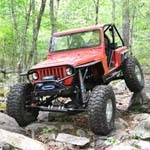 I have posted the above information to assist the owners and drivers of rock buggys in NH. It is the individual owner and operators responsibility to comply with the regulations as he/she sees fit. If anyone has any additional questions, please feel free to post up. I will answer to the best of my ability or forward to the state organization for an answer. Scott Hatch wrote: . . . No registration shall be required for an OHRV operated solely on land owned or leased by the owner of the OHRV. So any 4x4 (not just "rock buggies") that is not registered for the street must be registered as an OHRV to wheel on PRIVATE land unless you own or lease the land? Yes, any 4x4 that is not registered is an OHRV and unless you own or lease the land then a sticker is required. Would a NH Conservation officer come onto private property and cite people using non registered (OHRV or Street) 4x4s? Probably not but can they? Yes, this organization has filed for an event exemption for Fall Crawl the last couple of years. This information is for individual owners and operators and its there personal choice whether or not to comply with these regulations. a person who performs a service willingly, without pay or compensation. I assume that you do not need to be a resident of NH to register an OHRV? If I get an OHRV sticker for my "buggy" then am I all set to wheel at the usual trails that require the use of class 6 roads to access. If I go to an OHRV agent, and tell them that I'm registering a Jeep...will they allow me? The only reason I bring up the Jeep issue is that if I need the title to register is as an OHRV, it will say Jeep. But the only Jeep thing left is the firewall/frame. Maybe I need to bring a picture with me so they can see that it is not a street Jeep. An OHRV is any motorized conveyance, it can be a bone stock Jeep, tube buggy, ATV, or even a hovercraft. Scott Hatch wrote: What about traveling Class 6 Roads with my OHRV "buggy"? Scott, do we have a list of buggy "friendly" towns? Scott Hatch wrote: Yes, this organization has filed for an event exemption for Fall Crawl the last couple of years. The DWE Rock Crawl got hit with this a couple years ago too and now we have to file for the permit each year.